But what no one ever told you is the key to landing next job might not be just more money or more time – it’s what you’ve always had all along. It’s your own mind. Vered Kogan knows a thing or two about getting out of your head and making progress. As a job search expert through her private coaching practice and with Lee Hecht Harrison, she’s worked with hundreds of people making career changes. 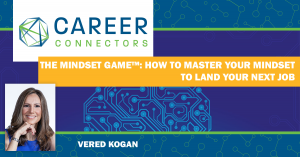 Her coaching experience found it is mindset that makes the difference and what Vered provides is not just strategy but help with execution that leads to success. You may have read, ”Life is 10 percent what happens to us and 90 percent how we respond to it.” (Charles R. Swindoll). But if you’re dealing with job loss or are switching careers, the associated mental and emotional conflict often triggers the brain’s defenses to send out hormones that are often counterproductive. It’s a good thing our brain has a natural negativity bias because it’s there to protect us and to keep us safe. Within the brain’s circuitry, negativity networks outnumber positive networks 5 to 1, so when we perceive threats or something that’s unknown, it much easier for our minds to default towards safety and comfort. When it comes to self-preservation, our brain tries to work in our favor: Stay safe! Conserve energy! Don’t put your finger there! And it also seeks out comfort: More sleep! More food! More Netflix! But while our brain tries to warn and protect us during a job change, stress hormones get released, the fight or flight response kicks in and bad things happen to our bodies because we are stressed. We can’t think, can’t sleep and we eat ice cream, chocolate and sweets. Blame it on our brain’s desire for feel good hormones like serotonin and too much of the stress hormone, cortisol, but these and your mindset can be managed, says Vered. So how do we get a handle on what we are experiencing and stop it from ruining our day? As a 15-year-old sophomore on high school junior varsity, future NBA basketball star, Michael Jordan saw his close friend selected for the varsity squad instead of him. Angered and depressed, he went home, locked himself in his room and cried. Rule 1: Decide what you are searching for and why. Behind our logic, there are deep seated reasons why we think the way we do. To make this rule work we must be intentional about focusing on a goal and ending the dilemma of too many options. If we don’t decide what to target, then by default our wily subconscious takes over and BAM! just like that we are distracted. Our subconscious has outsized influence on our thoughts and it out performs the conscious in information processing by a factor of thousands! While many of these systems are associated with maintaining our body functions it does underscore the latent power of using our subconscious to make our brains work on autopilot. Vered says to think of our subconscious as our personal goal achieving machine, there to help make us aware of opportunities that align with our set goals. But it needs to be given clear, positive, realistic instructions. So do this: Create a list of what is important in career, health, and family. What is it that you want to achieve? And more importantly – why? Think – what would it take for me to do this? Rule 2: Listen for clues. Know what direction you are facing (toward or away from what you want). Take your emotional temperature at least 4 times a day. Make it a habit. Ask yourself “What emotions am I feeling now?” Negative emotions (along with the associated stress hormones) limit your ability to perform at your best. Don’t serve or feed thoughts and emotions that will take you in the wrong direction, instead encourage positive emotions that free up your thinking and set your focus towards what you really want. Change your thoughts. Ask, “What story am I telling myself?” And verify, “Is this really true?” If it’s a negative thought then specify a new, more empowering belief by finding small proofs, reasons, past feedback and from who you know might be supportive. Change your emotions. Ask yourself, “What can I acknowledge myself for?” Call to mind even those small achievements and appreciation that you’ve received. Ask yourself, “What am I grateful for?” This is a fast way to keep yourself grounded and change emotions. Ask yourself, “What do I want to feel?” The Quick Coherence® technique is a powerful tool for shifting into a more positive & coherent state. Step 1 Focus attention in the area of your heart. Imagine your breath flowing in and out of your chest area, breathing a little slower or deeper than usual. Try inhaling for 5 seconds then exhaling for 5 seconds or whatever rhythm is comfortable. Step 2 Try to re-experience the feeling you have for someone you love, a pet, a special place, or an accomplishment or focus on a feeling of calm or ease. While negative emotions narrow our attention and force us to act in a specific way, positive emotions do the opposite: They broaden our attention and increase our awareness of possible actions we might take. Those are the beginnings of creativity. For Michel Jordan, it was not a matter of eliminating or forgetting the bad situation or anxiety but controlling and turning away from it by executing constructive behaviors. Rule 4: Keep moving until you find what you want. Commit to taking at least ONE action this week to move you closer (“warmer”) to your goal. It’s your life. Be persistent. Plan your own reality because what you believe is stopping you might just be in your head. Put these rules to work, take your career to the next level, stop thinking too much and start doing and see if this can help your personal, relationship and business challenges! Help families in need! Work with CRS to help insurance policy holders who have lost or damaged homes find temporary housing. This is a small company of about 160 employees. They’re hiring Customer Care Specialists to take care of families who have undergone loss, a Resident Specialist in sales (should have experience negotiating and facilitating) and a Relationship Manager who will work to increase business with current clients. If you are the nurturing and caring type, State Farm needs those who can help their clients who have lost something. Now hiring for customer facing roles for those who are trying to recover from unexpected loss. There are also tech positions open. Located on the Tempe Town Lake in one of the largest complexes in Arizona in Marina Heights. If you’re looking for a stable company that’s recession resistant, insurance is it. USAA’s mission is to facilitate the financial security of its members, associates and their families through provision of a full range of highly competitive financial products and services; in so doing, USAA seeks to be the provider of choice for the military community. They currently have 12 million members and over 33,000 employees worldwide, with more than 4,800 in Phoenix. The Phoenix campus is the only USAA office outside of San Antonio that supports all primary lines of business, including insurance, banking, investment management and financial planning services. Situated on 575 acres off I-17 and Happy Valley Road, USAA’s innovative and spacious work area offers a full array of campus amenities, while conducting business as a responsible steward of our precious natural resources. USAA Phoenix campus is LEED New Construction certified and LEED Platinum Existing Building certified by the U.S. Green Building Council, ENERGY STAR rated by the EPA, and has won multiple international awards for building excellence and sustainability. This company is interested in personal and professional development and will pay you to go to school! Main areas for job openings are: Customer Service and Sales, Insurance, IT and Risk/Compliance. Apply online at usaajobs.com. Not just a retail store but an organization that provides opportunities which serve the needs of the community and help the professional job seeker become self-sufficient. The Goodwill Career Center offers free career coaching, resume critiquing, job leads from employers, mock interviews, and digital skills training classes from beginning to advanced in 3 locations in Phoenix. Mesa location will be open next month as a new career center. Get started in the IT industry! GCU non-degree programs can provide everything to make you marketable in IT. There is a 16 week Coding Bootcamp that almost guarantees successful employment with connections with recruiters, community and hiring companies!